This is probably my most favorite time of year. My home is overflowing with autumn and harvest decor; the colors, the smell, the feeling of fall is in the air! Rich oranges, yellows, browns & greens, garlands of leaves and acorns, pumpkins, colored corns,combined with the heavy scent of pumpkin spice in the air... Mulled spices simmering on the stove and every shelf, nook and cranny filled with pumpkins, leaves, acorns and colorful berries just say, "fall is here." 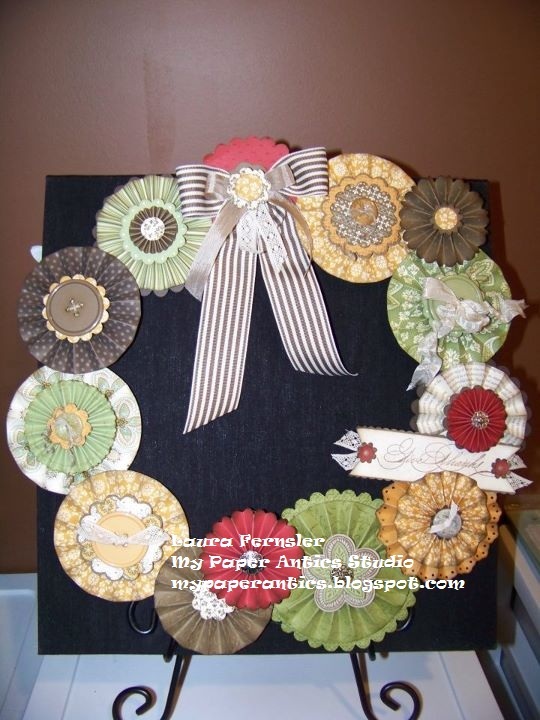 This beautiful fall wreath will add just the right touch of homemade creativity to your autumn decor. Can you just imagine the rich texture and the warm spicy colors nestled on your mantle (or piano...where mine will be) amidst a bed of berries and leaves, acorns and pinecones? Join me on October 6, at 2:00p.m. and you will be able to not just imagine it, you'll be able to actually see it! $18 RSVP with pre-payment is required. Paypal is available for online payment. There will be a Christmas wreath class, similar to this lovely fall wreath. If you sign up for both classes, you can take $4 off the cost of both, two classes for $28. Also, if you pre-purchase the Simply Scored scoring tool, you may take 1 class for $12. Contact me for more details. Wish I could be there with you in person! Thanks Cinda!! Me too Angel!!! I'm your newest follower, and I'm looking forward to seeing your projects. I also hope you'll stop to visit and follow me too.